I’ve been dealing with an abscessed tooth lately and haven’t been cooking as often as I’d like. What that means is my sweet husband had to cook, and by “cook”, I mean we ate out. By the end of a week of fast food, and an absence of vegetables, I was over the edge crazy for a good slow meal. Thankfully, yesterday I felt well enough to spend the day futzing around my kitchen, and thought stuffed peppers sounded both veggie filled and nostalgic. This was the first time I’ve ever made them, and sort of flew by the seat of my pants without a recipe. I cooked up some rice, grilled the vegetables and sausage, then finished it all off in the oven. 1. Make the rice according to package directions. Set aside. 3. Grill the sausages until char marks for. Allow to cool and dice. Set aside. 4. Prep the bell peppers by cutting the tops off and cutting out the membranes and seeds with a paring knife. Cut the stem out from the top ring. Rub the peppers in olive oil and place on the grill. Grill until char marks form but not completely softened. When cool enough to touch dice one bell pepper. Set the rest aside. 5. Meanwhile, cut the ends off the onion. Cut the onion in half and rub in olive oil. Rub the asparagus in olive oil and place both on the grill. Grill until lightly charred and mostly softened. Dice both when cool enough to handle. 6. Heat the oven to 375 degrees. Rub a 7x11 inch (2 quart) baking dish with 1 Tablespoon olive oil. Pour in the sauce and spread about the bottom of the dish. Line a jelly roll pan with foil and place the baking dish in the center to prevent spills. 7. In a large bowl mix together the rice, sausage, diced bell pepper, onion, asparagus, tomatoes, ½ teaspoon salt, red pepper flakes, and fresh cracked pepper. 8. Stuff the peppers with the mixture and gently pack down. Place in the sauce and sprinkle with Parmesan Reggiano Cheese. Top with a pepper ring. 9. Bake for 60 to 120 minutes or until golden brown and the sauce is bubbling. Wait 5 minutes before serving. Notes: I used Lucini Rustic Tomato Basil Sauce, and Chef Bruce Aidells Roasted Garlic & Gruyere Cheese Sausage. Both were from Costco. Ginger said it all. The only thing I can add is "Ditto." Thank-you. Your comments were a nice suprise! Mmmm, stuffed peppers. We love them. I really like your photo - love how you put the green top on the red and vice versa. 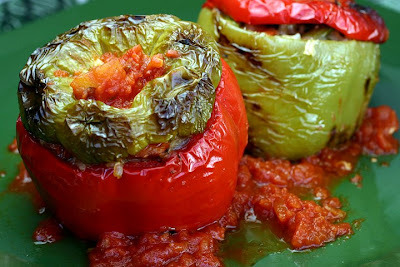 It really makes a difference by grilling the peppers... these look SO good! Nice (and unexpected) addition of the asparagus, too!